The furniture delivery came hours early, which meant that daylight through the one window could give a more accurate picture of the color. Although not completely, since they're both the same and somewhere in between the light and the darker. They look terrific against the new pale gray carpet. All the pillows but one on the couch I already had--my mother did the needlepoint birds in the small square ones and found the chintz in a fabric store--made the two rectangular ones. The chintz ones might have been made for it, the colors look so good. 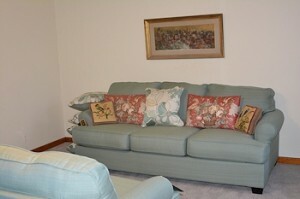 The fat square one in the middle came with the furniture (as did the stack beside the couch--four pillows for each. The painting above was my mother's, and I disliked it for years--but it looks a lot better hanging over this couch than it did before. Still not crazy about it. Right now, the loveseat is positioned to make a conversation area with the couch, without getting in the way of traffic from the front door to the kitchen. Those doors are awkwardly placed--not quite directly across from each other, and cutting the living room into two trapezoids if you draw a line on the floor. That wouldn't matter in a bigger room, but this one isn't very big. Still, I think this arrangement will work, at least for next week. There's another place in the house the love seat would be good (the large bedroom) and the right chairs would be a little more flexible in the living room. 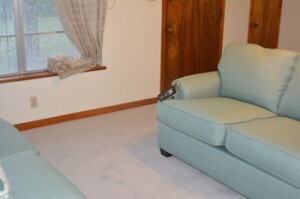 This view is toward the front door (that narrow little door is for a coat closet.) The very yellow light from right above the love seat (another legacy of the previous owner--there's a low-hanging ceiling fan ready to bash tall visitors shows on the love seat's cushions, but on the front you can see it matches the couch perfectly. Something narrow will eventually go in between the couch and love seat as a coffee-table/footrest, as well as end tables for the cough with good lamps to read by on them. But none of that can be done by Thanksgiving, because of the book nearing completion (and due Dec. 1) and Thanksgiving itself, the prep and all. The furniture's comfortably soft, but still supportive. I like it a lot. Wow - what a difference! It is! I barely recognized it. I really should have taken a picture of the earlier version, but it was so shabby by then I hated to. Besides, anyone who saw it probably still has the screaming/clashing blue/olive/mustard scratchy flowered upholstery on that old sofa imprinted in memory. Yeah it looks really good. *Very* nice! I hope you & your company have a big time over Thanksgiving! However (there's always a however, right?) I found out this afternoon that the new furniture outgasses a strong glue-like smell in a closed up house. Opening the windows helped instantly but it's going to take awhile and the weather is not going to cooperate. Tomorrow morning we're getting a strong cold front with a line of rain in front of it (brief, but bet it can blow in.) Twenty degrees colder tomorrow than today, with gusty winds. Hope I can clear the smell out before T-day.